This is a continuation of a series of travel posts of a week I spent in Illinois to visit my children. To start at the beginning go HERE. The rest of the posts are HERE, HERE, HERE and HERE. 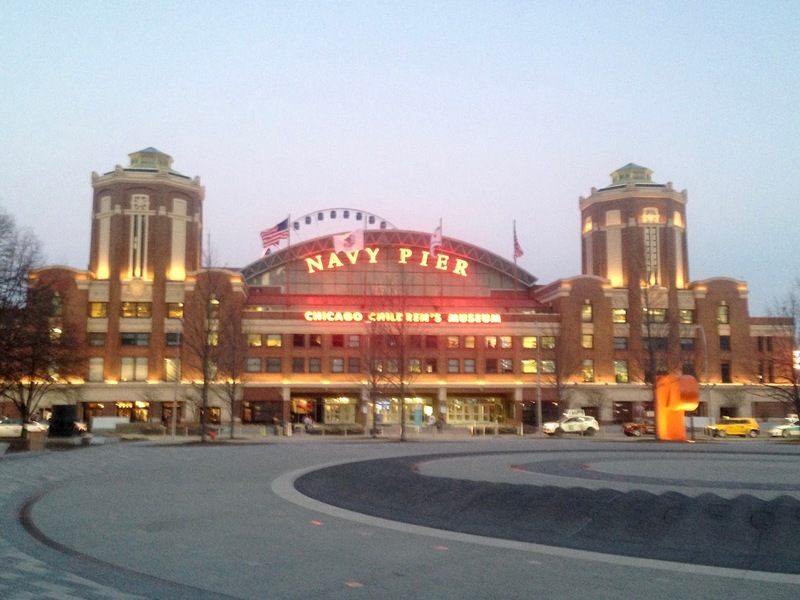 After my daughter and I were finished shopping on Chicago's Magnificent Mile, we then walked over to check out Navy Pier as I had never been there before and I really wanted to see it. Navy Pier is a 3,300 foot long pier on the Chicago Shoreline of Lake Michigan. I have seen a lot of piers in my lifetime, but this by far was the largest and most beautiful pier I have ever visited. 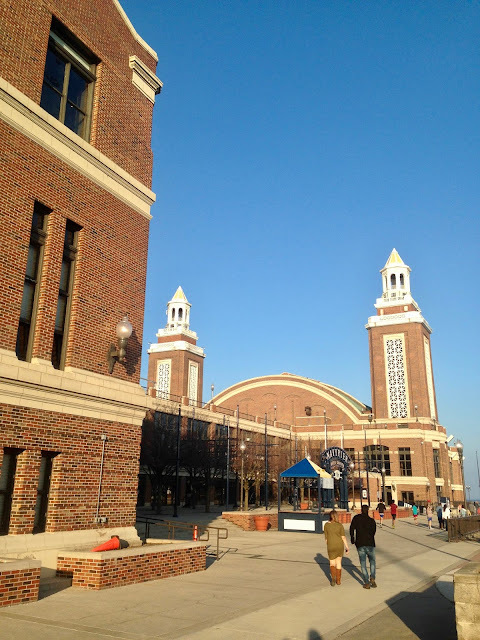 The entrance to this pier is this gorgeous building which is filled with shops, restaurants, a children's museum, and a atrium. Outside of the building is a lovely park; this cement portion in the picture looks like it is probably a water feature for the kids to run through. But seeing that I was there in February, it was not functioning. 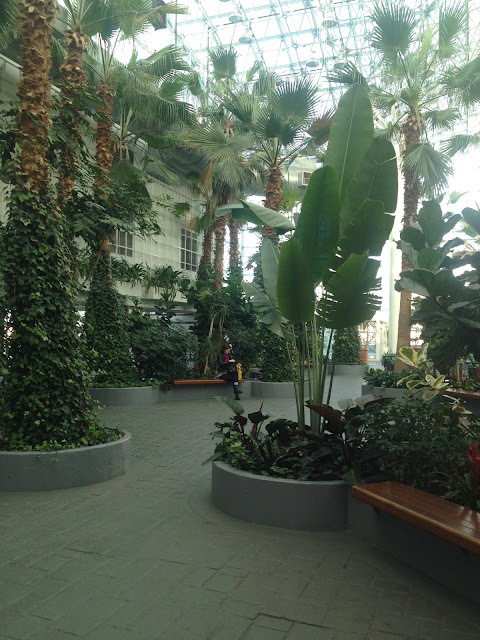 This is a view of the inside of the Navy Pier building as seen from the escalator going up to atrium. There was some type of construction going on when we were there. 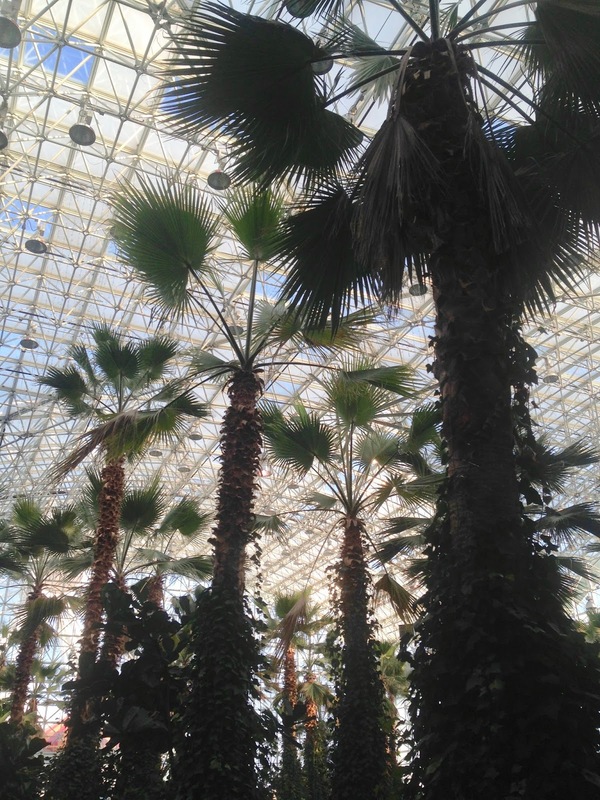 The atrium, called Crystal Gardens is one acre, six story glass atrium with a fifty foot arched ceiling. There are lots of benches to sit and rest awhile; and we did, as we were exhausted from walking here from the Magnificent Mile. 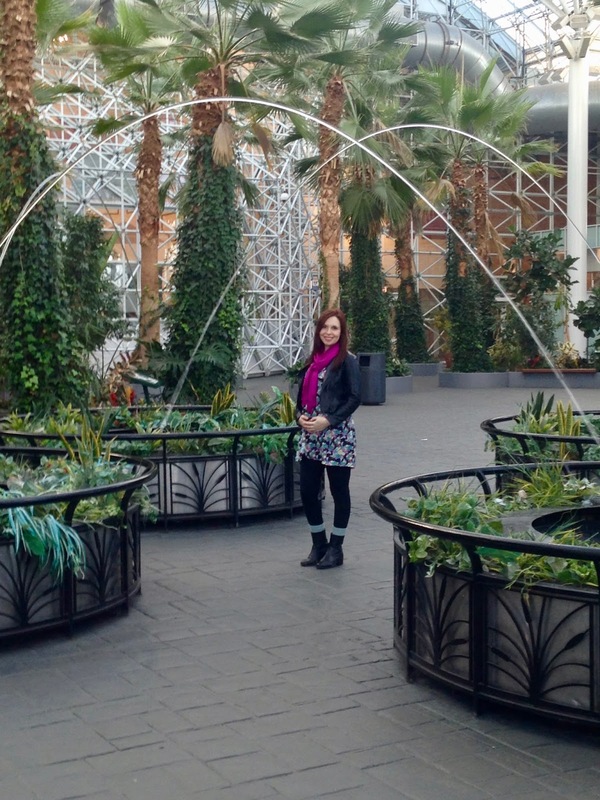 My favorite part of the atrium were the fun water features. Now I must admit February is not the best time of the year to go to Navy Pier because most activities are closed for the season. 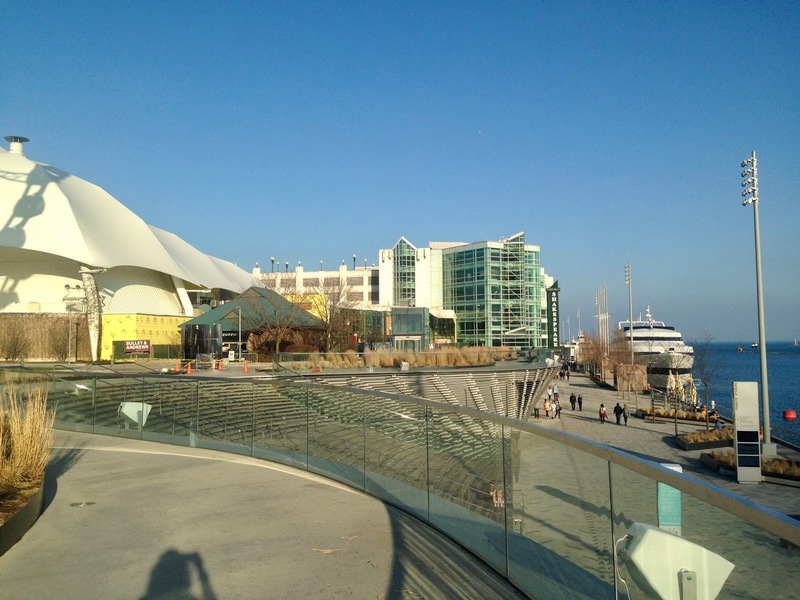 If you ever do get to go to Navy pier, visit during the summer. There are concerts, outdoor food vendors, theatre shows, boat rides, other amusement rides, and fireworks every Wednesday and Saturday evening. 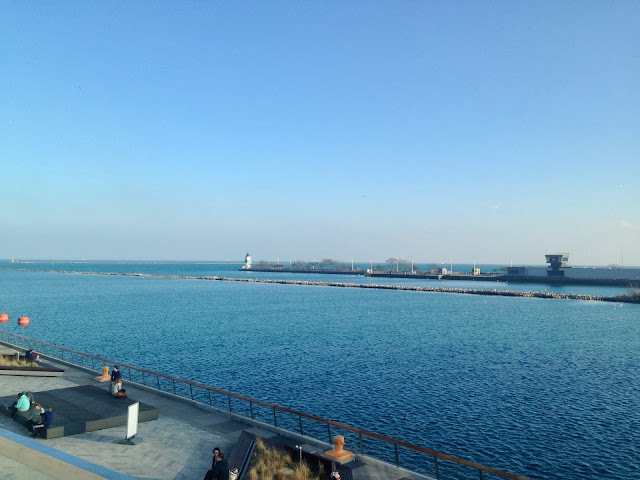 However, even though a lot of things were closed for the season, it was still worth going to see the gorgeous lake view. The pier is filled from end to end with gorgeous buildings. We peeked inside a few of them, but everything was quite desolate with not much going on in the middle of a winter week day. When I got home I read about all these buildings and discovered that they have a indoor ice rink, an Imax theatre, the Pepsi Skyline Theatre which holds a variety of live events ranging from music and theatre to acrobatic shows, the Chicago Shakespeare Theatre, and even a Funhouse Maze. You can also rent the facility out for conventions, weddings, etc. 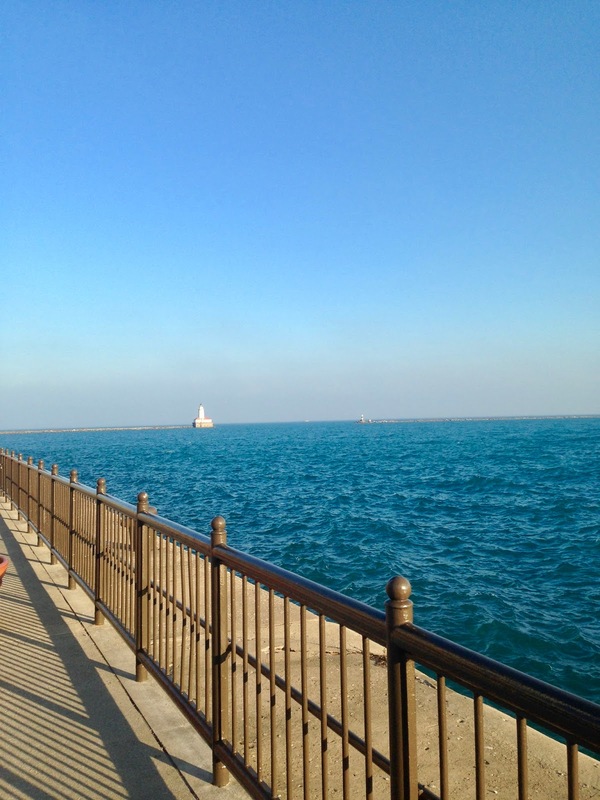 But the nice part of visiting the pier on a warm winter day is that you pretty much have the entire pier to yourself! It was so peaceful and quiet; a great opportunity to just soak up the beauty surrounding you! 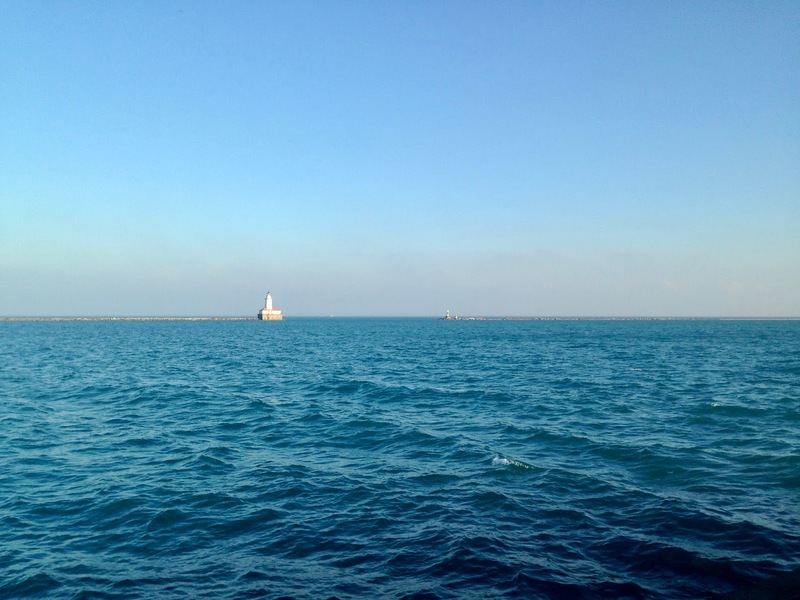 I am always amazed at how blue the waters of Lake Michigan are. Such a gorgeous view! The ferris wheel was the only amusement ride operating this day. We had planned on taking this ride for you get great views of the Chicago skyline on it. 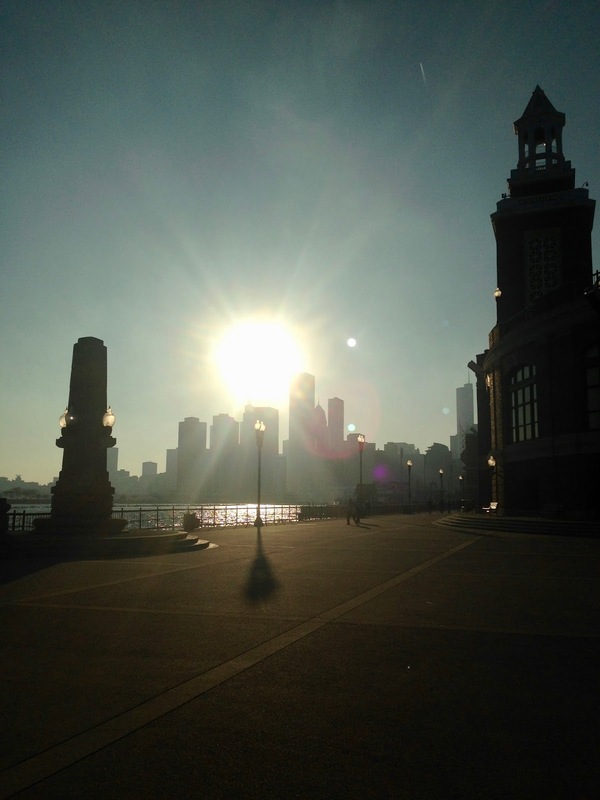 But we were at the pier at the worst time of the day: the sun was just blinding! We knew we wouldn't be able to see much so we skipped it. By the time we walked all the way to the end of the pier and then stopped inside for a snack, the sun was starting to set for the day. We had a gorgeous view of the sun settling behind the Chicago's sky scrapers as we walked back to our car. I hope to get back to Navy Pier sometime and hopefully get on that Ferris Wheel and/or see some fireworks or a show. I'm sure I'll have another shot since my kids only live 45 minutes away! Next week I will finish my Illinois Travel Series with just some random shots and photos of my week. Then I will be taking a ten day blogging break as I am headed to Myrtle Beach! I am so excited! It will be my first real vacation since last May when we headed to Las Vegas. Please pray for safe car travel; it's the only thing I'm really worried about as we had car problems on our last vacation. We are taking the same car which has over 100,000 miles on it and I'm nervous it's going to break down again. I'm also worried about Jackson being separated from us for so long. When I left him for seven days to visit the kids, he was really mad at me....seriously! He wouldn't even come near me! That lasted a about an hour, then he forgave me. But now not only will I be gone, but his 'daddy' as well and he will be staying in someone else's home. So who knows how he will react. It'll be so hard for me to separated from him for so long. How do all of you handle being separated from your pets while on vacation? Enjoying your travel musings, you have a great appreciation for the world around you. Re pets, I don't do separation well and in the past, we have taken our dog with us whenever possible. Even to the extent of driving 1500 miles to Texas instead of flying so that he could accompany us. But then my husband and I are a big dog-crazy. Thank you! When my husband and I travel we see so many other travelers with dogs, even in hotels! But I think unless we get an RV (which is possible in our retirement years) traveling with a cat is a little more difficult. We are definitely thinking about it though! Amy, the pier being desolate sounds nice to me. I hate being in a crowd but visiting inside these buildings would be nice, too. I love how there are two lighthouses visible in a couple of your shots. Lake Michigan is beautifully blue. If ever we visit Chicago it will definitely be in the warmer months. I can't stand the blowing cold winter and there's an abundance of that in that part of the country. lol I love the sun setting behind the building. It looks incredible big being so low on the horizon and the structures in the foreground are just dark enough to give the sky the necessary contrast - excellent shot! You have a natural eye for photography, my friend! Thanks for joining my not-so WW linky party and for visiting today's edition of Art Sketching Through the Alphabet! Awww, thanks so much! My photography eye is good, I just need to improve in the technical dept. Thats where it gets hard! I was raised in the Chicago area, but haven't been there in about 40 years so things have definitely changed! Great photos. Thank you. 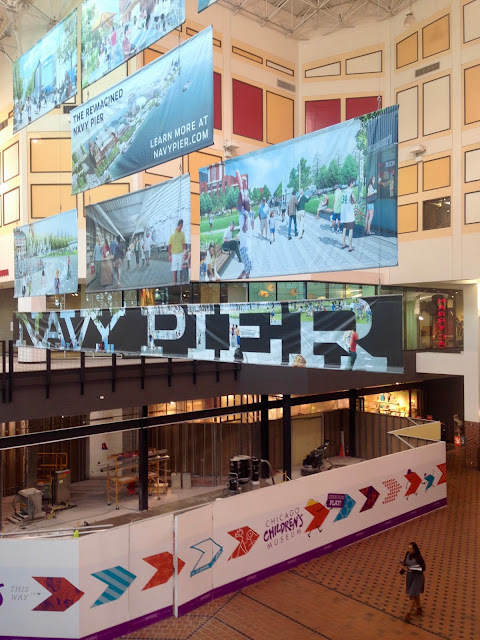 When researching the pier I saw a lot of old photos of it...things really have changed! I went to the pier on my first trip to Chicago, which was probably 15 years ago... yet, haven't made it back there in more recent trips. I def. have forgotten how it looked! So pretty! Thanks Carrie, it is so pretty isn't it? Love the pics, especially the lake shots. So timely you mention pets. I've just returned from some weeks away. My cat stays home with cat sitters. When I return he spends the evening and night very vocally telling me off, then sticks to me like glue. Oh that cracks me up! Jackson did the same to me. When he saw me, he stopped suddenly then walked very slowly to me. I let him smell my hands while I talked to him. Then he let me hold him for a few minutes but I could tell he was mad so I put him down. Later every time I walked near him, he did a "get away from me" meow. It was so hurtful! So I just stayed away from him, and later he just came to me. Cats can be so weird!